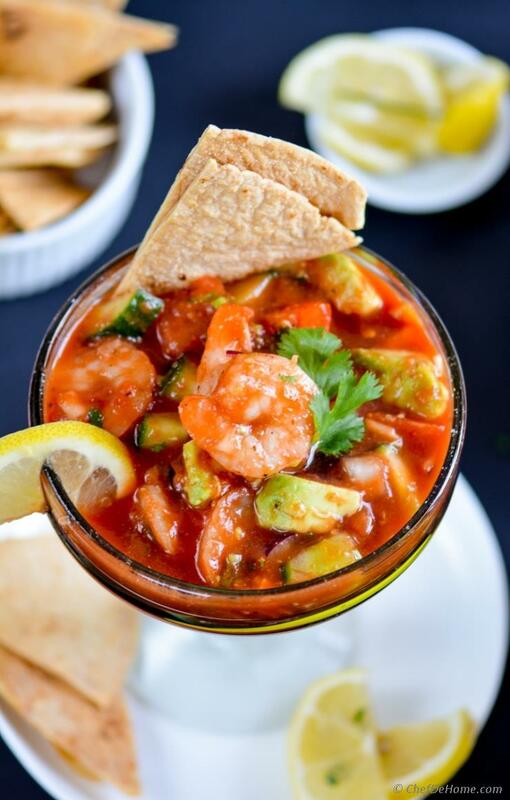 Mexican-style shrimp cocktail loaded with crunchy cucumber, celery, red onions, creamy avocados, cilantro, shrimp, and lots of zesty flavors. 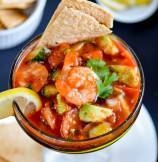 Serve with a big bowl of baked tortillas chips for healthy, and zesty holiday entertaining!! All of these flavors complement each other so well that I decided to change few traditional ingredients in classic Mexican Shrimp Cocktail. Yes, this not that same same old shrimp cocktail recipe! 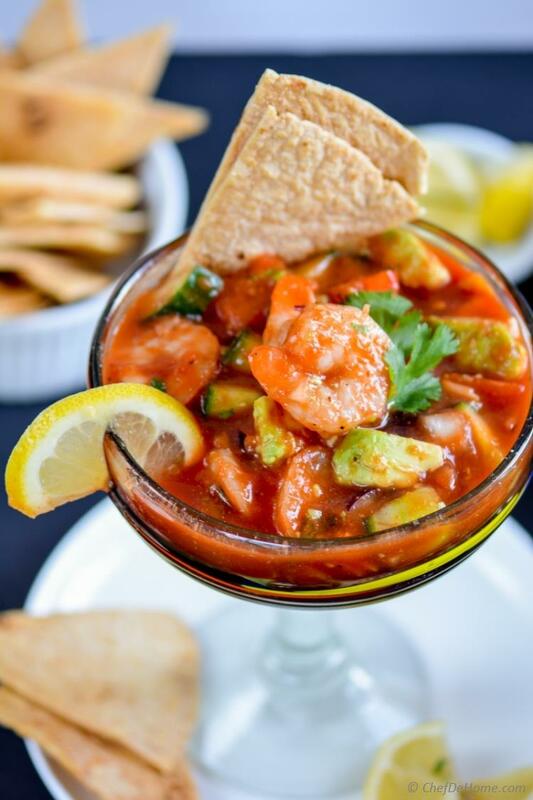 This shrimp cocktail is kinda like fresh zesty salsa, bloody merry, and shrimp served in same bowl! drooling!! Isn't it? Holiday entertaining can be messy and I admit time and again that I'm always messy in the kitchen. :) You know! When you want to bring bold flavors in every thing you cook and are enthusiastic to serve a lots of homemade treats to you friends..... kitchen has to get messy! Isn't it? Often I will answer the door bell with hairs covered in flour..... One of my friend often says: "This shows you have been cooking all day and not paying takeout bills. haha". I'm like: "thank you! Someone thinks this food is homemade!" My family's cooking mantra? Put on apron, get busy in the kitchen, no worry if it gets messy.... just cook so awesome food that your guests have best time ever! PS: For the record, if Vishal tries to help me in the kitchen it gets even messier. lol! But why worry when you have tools to clean the kitchen mess in no time?! For cleanup post-party and even when cooking all day, one tool I rely on is my Delta Kitchen Faucet. Gosh! I love it! I mean..... seriously! Once I'm in the kitchen, ready to cook..... I set the Delta Faucet on to lukewarm water. Then, every step of the way, I'm on my kitchen sink... just touch the faucet, wash, touch again! Voila! Mess-free cleanup every-time. Amazingly, this way I also avoid so much water wastage. Specially when handling raw seafood or meat, it so important not to touch anything. At such time, Delta Touch2O® Technology is perfect for my Kitchen. 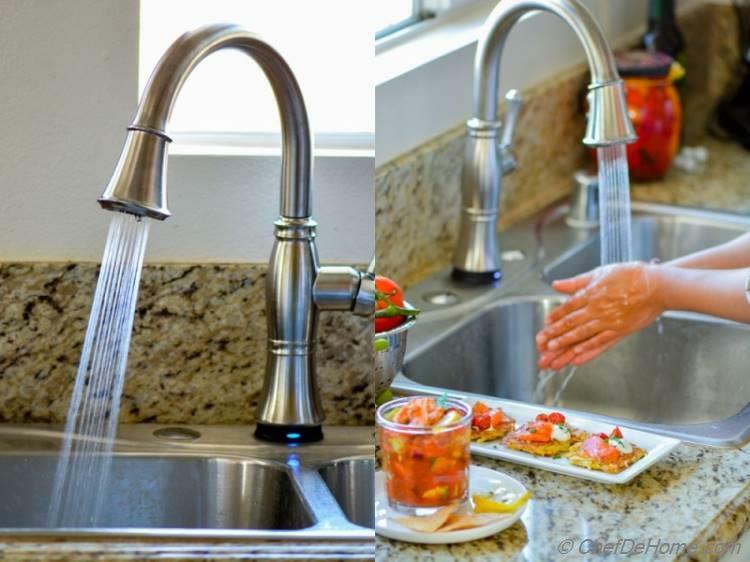 Since I own Delta Touch2O® Faucet, I spend no time whipping the kitchen faucet after handling and touching faucet with raw-chicken-touched hands! The most imp for me! 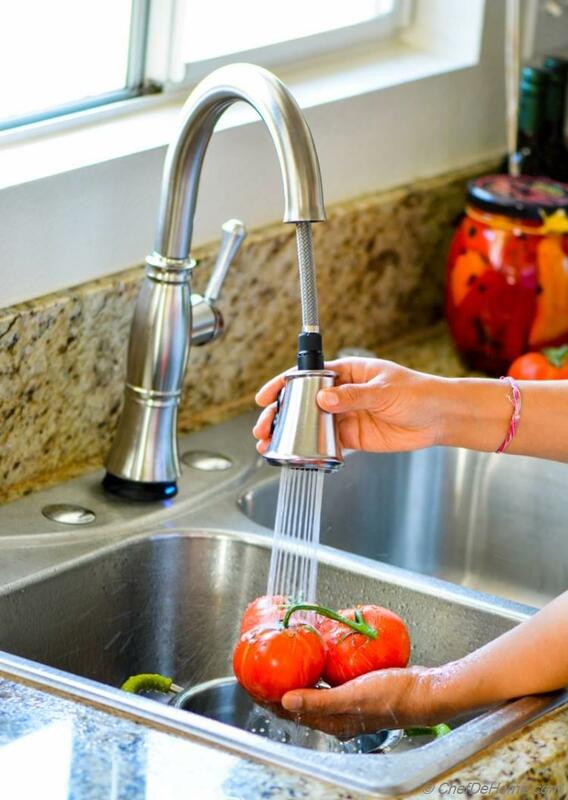 After every such raw dealing, my kitchen surfaces must be thoroughly cleaned and so should be my hand and Delta Faucet makes it much easier and mess free. Delta Faucet believes in the transformative power of water, and exists to deliver those daily transformations to their consumers. As the leading faucet manufacturer for 60 years, Delta Faucet has provided quality products and innovations that change the way consumers experience water in their central, everyday living spaces - their kitchens and baths. Gosh! 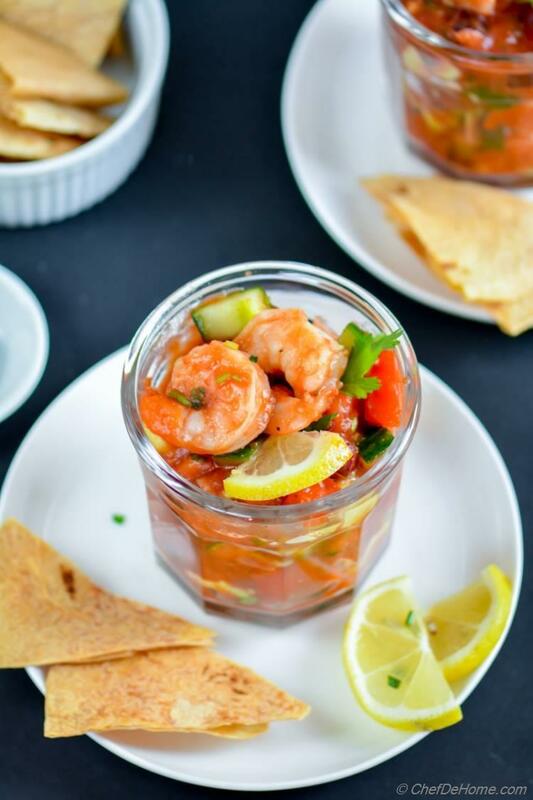 Can you resit this gorgeous Shrimp Cocktail served with crispy baked tortilla chips? Look at me! Not just bold flavors, I'm even taking care of your holiday calorie-intake. So, let's get mess, cook scrumptious and bold flavors and enjoy holiday season 2015! Don't forget to share your favorite Holiday Appetizer?! This is a sponsored by Delta Faucet. All opinions are mine alone. Total Time 25 minutes Prep Time 10 minutes Cook Time 15 minutes Difficulty Easy Yields 4-6 Shrimp Cocktails Serves 4 Notes No. of servings depends on serving size. Smart Swap Love Shrimp? 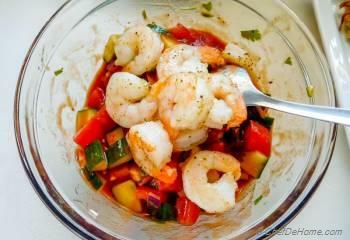 Use Jumbo Shrimp instead of regular! 1. 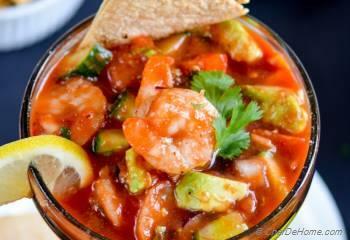 Prepare Shrimp - Fill a deep pot with 3 quarts of water, then add bay leaves, salt, and lemon slices. Bring to a boil and then simmer 5-8 minutes. Increase heat, add shrimp then boil for about 1.5 minutes or until shrimp is bright pink (no raw spots). Remove with slotted spoon and set aside to cool completely. 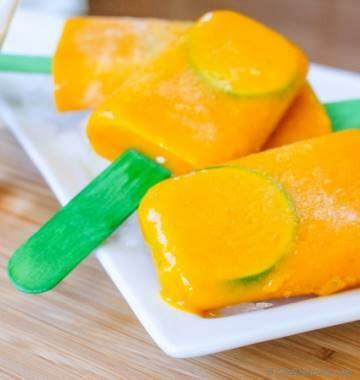 For fast cooling refrigerate after cooking. 2. 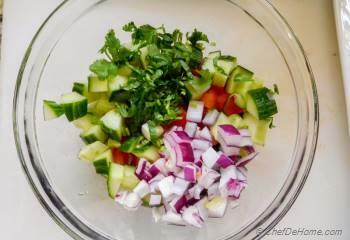 In bowl, add all diced veggies except avocado with half of the cilantro. 3. Add bloody mary mix, clam juice, lemon juice, and cooked shrimp. salt (and some cracked black pepper, if like) to taste. Toss gently to mix everything. Cover and refrigerate until ready to serve. 4. 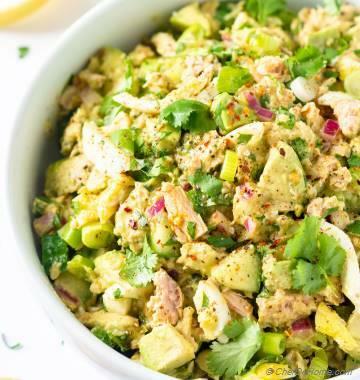 Just before serving, add diced avocado, and remaining cilantro. Taste and adjust salt. 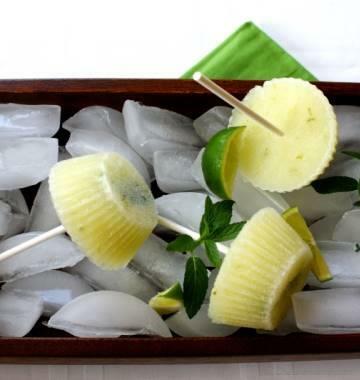 Scoop into serving glasses, top with tortilla chips and some lemon wedges. Serve and enjoy! 5. (optional) For Baked Chips, preheat oven at 425 degrees Fahrenheit. 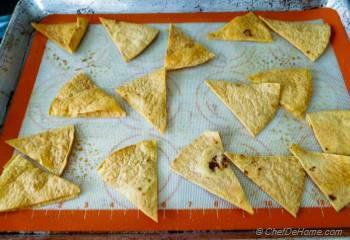 slice 2-3 large tortillas into triangle wedges. Spray with cooking oil spray and sprinkle with some salt. Spread on a baking sheet and bake for 10-15 minutes or until chips are lite brown and crispy. Can't find Bloody Mary juice? Use 2 cup tomato juice such as V8, 1/4 cup tomato ketchup, 1-2 tsp hot sauce (more or less per taste), and 2 tablespoon lime juice. Can't find Claim Juice? Use half bloody Mary and half Clamata Juice. Clamata juice is mix of claim juice and tomato juice. Vegan Mexican Cocktail? If want to serve vegetarian/vegan guests, just skip shrimp and claim juice.